Nestled on 35 acres of lush lawns and tropical gardens, this charming garden-view retreat on Kiahuna Plantation puts you in the center of it all - just a few minutes walk from the Poipu Shopping Village, Poipu Beach Athletic Club, and world-renowned Poipu Beach. 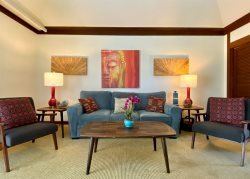 When it’s time for a little downtime, head into the cozy living room, where the new furniture beckons you to relax. You’ve spent the day riding the waves outside, now it’s time to relax and do another type of surfing, flipping through the cable channels on the flat-screen TV. Keep up with your favorite shows or cuddle up for movie night in bed with two flat-screen cable Smart TVs available, or stream shows to your device with the free WiFi. A plush king-size bed and a full bath make this one-bedroom, ground-floor condo a great romantic getaway for two, but if you are traveling with others, a sleeper sofa in the living room comfortably sleeps two more. 1. Perks Galore: Not only does Kiahuna Plantation 420 come with a vacation membership to Poipu Beach Athletic Club, but a free midsize car rental for exploring the island too! 2. A Rare Retreat: Very few properties have such a rich history that dates back to Hawaii’s sugar plantation days and front an award-winning beach in Kauai. 3. Lots To Do: With a beach activity center, picnic areas and grills, live Tahitian dance shows, botanical gardens, and Kauai’s most popular beach all just a short walk from your rental, it’s no wonder Kiahuna Plantation was named one of the top five hotels in 2014 by Conde Nast magazine. Condo 420 is located on the 1st floor in building 41. The response time was amazing. All communication was professional, friendly and helpful. ---MANAGER'S RESPONSE: Mahalo for your feedback! We hope you will return to beautiful Kauai soon! Overall we loved it. My husband would have loved a bigger pool to do laps - in fact, we did not use the pool once. We really liked having the gym. The condo was very comfortable. The bathroom shower/bathtub sliding glass panel could use an update. ---MANAGER'S RESPONSE: Mahalo for your feedback! We hope you will return to beautiful Kauai soon! Enjoyed the kitchen supplies as we were able to cook meals in there many days of our trip. Its a quick walk through the Marriott grounds to Poipu Beach. There are boogie boards, beach chairs, a beach wagon (left by us), coolers and a mat for your time at the beach. We had an issue with my child pulling the towel rod off the wall and the staff were super nice and accommodating. This condo is very comfortable and well maintained. Beware that the Athletic Club does not have a shower if you are departing after check in though. We found that out the hard way after checking out and taking a 9pm flight that night after a beach day afternoon. MANAGER'S RESPONSE: Hi Sara, So glad you had a great time! The showers and locker rooms at Poipu Beach Athletic Club are coming along quickly so they should be done by the time you come back. There is the one outside shower next to the pool but this new facility is going to be super handy for people that have a late flight. Hope you come back and see us soon. Review for Kiahuna Plantation 420 dated 11/5/18 on Airbnb: Enjoyed the kitchen supplies as we were able to cook meals in there many days of our trip. Its a quick walk through the Marriott grounds to Poipu Beach. There are boogie boards, beach chairs, a beach wagon (left by us), coolers and a mat for your time at the beach. We had an issue with my child pulling the towel rod off the wall and the staff were super nice and accommodating. This condo is very comfortable and well maintained. Beware that the Athletic Club does not have a shower if you are departing after check in though. We found that out the hard way after checking out and taking a 9pm flight that night after a beach day afternoon. Great location and nicely decorated with modern furniture and decor. Responsive via text when additional things needed. I was so surprised with the ample amount of shampoo, conditioner, lotion, paper towels, toilet paper, dish soap etc. We did not need to go to store for any of these items and that was great. Extra pleased that their were beach chairs and a small cooler. So the amenities were great. The only other thing I wished it had, were salt and pepper. The condo is a simple, open 1-bedroom with modern appliances and personal touches of the owner. The rear patio opens onto a pastoral lawn with mature Chinese ficus trees. This and the responsive management of Great Vacations Rentals made for a perfect retreat after spending time on the beach and in the ocean.